The technology conference InnoTech Ukraine 2016, took place in Kiev from March 11 to 12. Noosphere once again joined the event to represent several of its innovative partners. The 2-day conference gathered together Ukrainian and foreign specialists interested in technological innovations to show off the latest achievements of modern technology. This year, more than 3500 guests and 50 speakers participated in the conference. High-lights included Demo-zone, the Conference and Speed Dealing. The conference was divided into six sessions on different themes. The “Innovation Trends”, “Healthcare” and “Education” sessions took place on the first day of the event. The second day was dedicated to sessions on “IT-Clusters”, “Startups” and “Investors”. The Speed Dealing was the liveliest place at the conference, as participants presented 30 potential projects to 20 representatives of investment and venture capital funds. During the conference developers who are interested in securing investments were able to get quality advice and feedback, and even discuss possible financing for their projects. In 2016 Noosphere was represented by the Noosphere Engineering School. The team prepared presentations for their in-house projects such as the L.E.D. Ball, CamTouch, ArtOS and a meeting with the robotic fan favorite – NAO. The L.E.D. Ball project is based on the ability of the human eye to connect rapidly changing images and videos into a single image. As the ball spins the lights are able to create an image in the ball. The L.E.D. Ball can be used for conferences, presentations and exhibitions to display a logo or slogan in a creative way. CamTouch, an interactive, analogue blackboard, received technical support from Noosphere. The system combines hardware and software to allow a user to make any surface interactive. The project lets people take notes on a virtual screen, control a presentation and interact with content installed on the computer. ArtOS was the most popular project at the forum. Students from the Noosphere Engineering School built it in just 4 months. This program can automatically control the firing of a gun, significantly reducing the response time for artillery fire missions. They hope they will be able to optimize the work done by a part-gun platoon, battery, or division in the future. 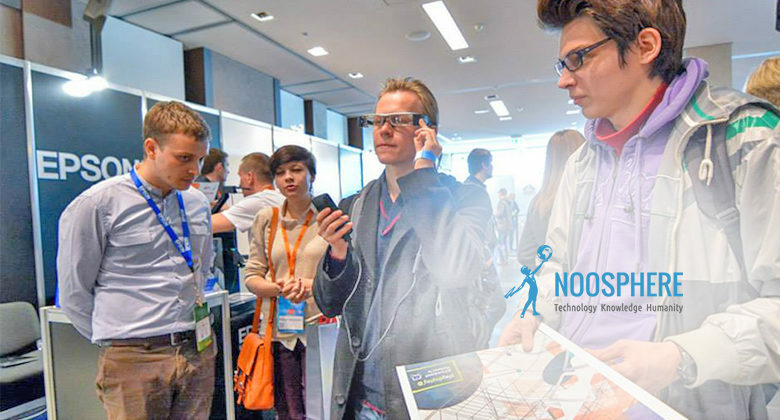 In addition to the niche projects which were presented at the conference, participants and guests learned about upcoming events that will be organized by Noosphere. This year will be devoted to three innovative technologies events – the Vernadsky Challenge, BestRoboFest and the Copter Race. Noosphere has invited everyone to submit their applications to the engineering startup competition, become members of the first large-scale robot festival and show off their sills by designing and controlling an aerial drone for the copter race.